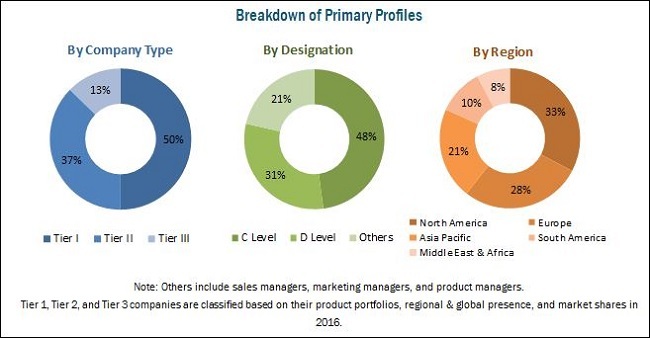 [153 Pages Report] Flue Gas Desulfurization (GFD) Systems Market size was valued at USD 15.16 Billion in 2016 and is projected to reach USD 21.00 Billion by 2022, at a CAGR of 5.6% from 2017 to 2022. The major drivers for the growth of the FGD system market across the globe are the stringent enforcement of various federal laws and regulations that mandate SOx emitting industries to install air quality control equipment in their plants. For company profiles, 2016 has been considered as the base year. In the cases, wherein information has been unavailable for the base year, the years prior to it have been considered. The value chain of the FGD system market includes raw material suppliers and service providers. Mitsubishi Heavy Industries (Japan), General Electric (US), Doosan Lentjes (Germany), Babcock & Wilcox (US), RAFAKO (Poland), Siemens (Germany), FLSmidth (Denmark), Hamon Corporation (US), Clyde Bergemann Power Group (UK), Marsulex Environmental Technologies (US), Thermax (India), and ANDRITZ (Austria), among others are the key players operating in the FGD system market. Scope of the Report: This research report categorizes the FGD system market based on installation, type, end user, and region. The report forecasts revenues and analyzes trends in each of these submarkets. The flue gas desulfurization (FGD) system market is projected to grow from USD 16.00 Billion in 2017 to USD 21.00 Billion by 2022 at a CAGR of 5.6% between 2017 and 2022. 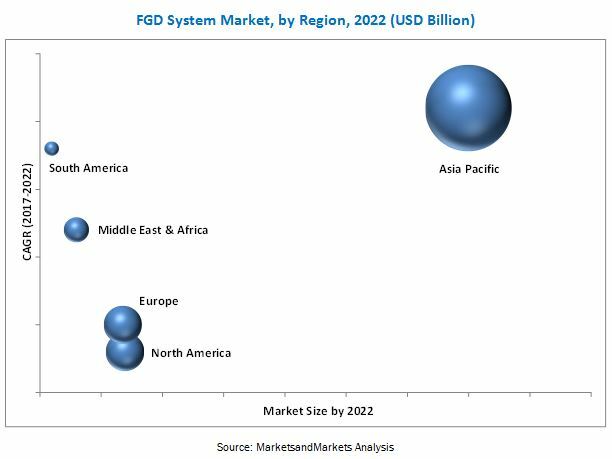 The FGD system market has been witnessing consistent growth across the globe, owing to the increasing concerns worldwide regarding environmental pollution, growing prevalence of airborne diseases, and implementing of various environmental laws and regulations in different countries, worldwide. The rise in demand for FGD systems from the power generation, chemical, iron & steel, and cement manufacturing industries is expected to drive the growth of the FGD system market across the globe. The stringent implementation of various environmental regulations to control the excessive industrial sulfur dioxide emissions is further expected to drive the growth of the FGD system market during the forecast period. Based on type, the FGD system market has been segmented into wet FGD system and dry & semi-dry FGD system. The wet FGD system segment is expected to lead the FGD system market during the forecast period. The growth of the wet FGD system segment of the FGD system market can be attributed to the increased adoption of wet FGD systems in various industries due to their high efficiency to remove sulfur dioxide (SO2) from the flue gas. Moreover, the formulation and stringent implementation of various emission standards set by a number of federal governments, increased demand for electricity, and rise in the number of coal-fired power plants in emerging economies are also fueling the growth of the wet FGD system segment of the FGD system market across the globe. Moreover, the growth of wet FGD system segment of the FGD system market can be attributed to the early commercial deployment of wet FGD systems, which took place in 1970 and their high efficiency in terms of removal of sulfur dioxide (SO2). Moreover, the by-product of typical wet FGD systems, which use limestone as a reagent, is gypsum. Gypsum is further used by cement manufacturing and fertilizers industries. Based on end user, the power generation segment is estimated to account for the largest share of the FGD system market in 2017. The coal-fired power plants are the major source of sulfur pollutants as they use high sulfur content coal for power generation. Therefore, the increased demand for power is fueling the growth of the power generation end user segment of the FGD system market across the globe. The Asia Pacific FGD system market is expected to grow at the highest CAGR during the forecast period due to the increased demand for FGD systems from the power generation industry. This enhanced demand for FGD systems has resulted from the stringent implementation of various emission regulations for the power generation industry of the region. The growth of the FGD system market is primarily driven by various factors such as the stringent implementation of various air pollution control regulations, rise in environmental awareness, and use of coal for electricity generation across the globe. However, high initial installation costs of FGD systems and their high operational energy and waste disposing requirements are some of the factors expected to restrain the growth of the FGD system market across the globe. Mitsubishi Heavy Industries (Japan), General Electric (US), Doosan Lentjes (Germany), Babcock & Wilcox (US), RAFAKO (Poland), Siemens (Germany), FLSmidth (Denmark), Hamon Corporation (US), Clyde Bergemann Power Group (UK), Marsulex Environmental Technologies (US), Thermax (India), and ANDRITZ (Austria), among others are the key players operating in the FGD system market across the globe.